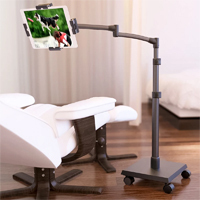 The LEVO G2 Deluxe Floor Stand is an adjustable iPad, tablet and eReader stand that allows users to sit comfortably, lie back, or relax in bed while securely using their tablet or eReader without having to use their hands. The sturdy materials and solid design minimize bouncing and significantly reduce the risk of tipping, ensuring uninterrupted viewing comfort. The LEVO G2 stand has a 5-axis articulating arm for easy positioning with adjustable tension for optimal movement in any direction. The user can also interchange platforms from tablets and eReaders to books, and back again (the book platform is sold separately as an accessory). The holder accommodates tablets and eReaders up to 8.7" x 12" weighing up to 4 pounds. Height range of movement is between 30" to 56" (measured from floor to center of tablet platform). It is mobile, durable, versatile, quick and simple to adjust, and no tools are required. The LEVO G2 Deluxe Floor Stand is available in the original Gunmetal finish as well as two new finishes, warm Cherry and rich Espresso. These woodgrains blend well into any office or home environment. Available in Three Colours: LEVO G2 Deluxe Floor Stand for iPads, Tablets and eReaders is now available in 3 colours to match any decor. The Options are Gunmetal, Cherry Woodgrain, and Espresso Woodgrain. See the image gallery for images of these.